According to the SBU chief, "this goes to show who really values him". The separatist Donetsk People's Republic has put Volodymyr Ruban, who was arrested by the Ukrainian authorities on suspicion of arms smuggling and plotting a terrorist act, on a prisoner exchange list, the chief of the Security Service of Ukraine (SBU), Vasyl Hrytsak, has said at a briefing in Cherkasy, according to 112 Ukrayina TV. "We were also surprised when we got this information. The Donetsk side asked for Volodymyr Ruban and put him on the list of those it is interested in exchanging. This goes to show who really values him," Hrytsak said. Ruban was detained on 8 March on the line of contact as he was bringing in a large batch of arms. He is accused of plotting terrorist acts in central Kyiv, plotting a coup d'etat and illegal arms smuggling. 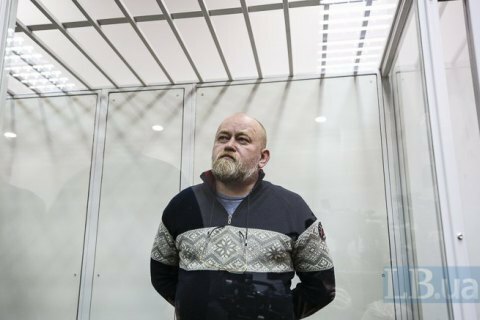 On 9 March, a court in Kyiv arrested Ruban for 60 days and denied him bail. On 4 May, his arrest was extended by two months, until 2 July. One more important defendant in the so-called Ruban case is MP Nadiya Savchenko, who had planned to bail Ruban out before she was placed into custody herself. During the latest prisoner exchange between Ukraine and the separatists on 27 December last year, 73 Ukrainians returned home while 233 people were sent to the occupied territory.